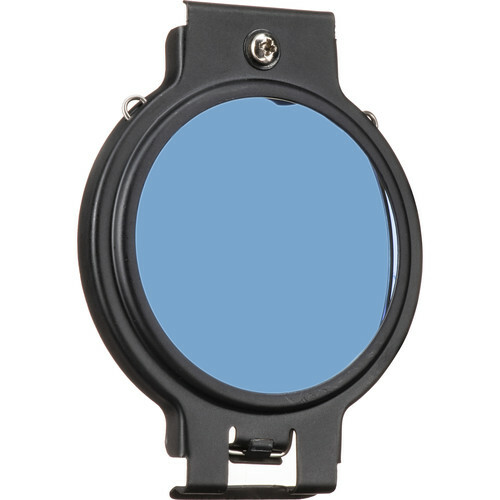 The Lowel Dichroic Filter comes with Swing-in Holder (iP-51H) This glass filter converts tungsten to approximate average daylight. Expect a 50% (one f-stop) loss of light when using this filter. It includes ViP Swing-in Accessory Holder (iP-30). Box Dimensions (LxWxH) 5.8 x 4.65 x 2.2"
Dichroic Filter with Holder for Pro, i-Light is rated 4.3 out of 5 by 4. Rated 3 out of 5 by Paul Anderegg from Cheap, but cheap....and green First off, I should mention, as others in the filter only reviews have, that this filter produces a light with a green hue. That being said, I found that when used for ENG type field work, where you are simply blasting away shadows or whatnot during harsh outdoor lighting interviews, it works very well. I used this mostly for indoor daylit scenes where I had bright windows, and a mix of indoor incadescent lighting, and found that using this filter and the ATW produced very good results. It looks greener to the eye than it will on the video. After only a few uses though, the filter fell out of the holder and shattered on my last shoot, while I was simply walking along, no jarring or shaking. I checked the holder, and the clip were still in their slots, firmly secure. Have no idea how it fell out, but the filter glass is cheap to replace. Rated 4 out of 5 by Rick from Perfect for my needs I have a mobile portrait studio.? Recently I switched over from tungsten floods to daylight LEDs.? However, I had been unsuccessful in finding a small but affordable LED key light to illuminate a neutral-colored background, so I continued to use a tungsten Pro-Lite, equipped with a gel frame.? This was unsatisfactory; the gels quickly faded from the heat of the lamp and there was far too much light spillage out the sides.? The Dichroic Filter, mounted on the #LOBDFPL barndoor frame, successfully adjusts the color temperature to approximately daylight, doesn't spill unfiltered light, and so far have maintained the factory color.? All for far less than the price of even a cheap special-purchase LED instrument. My only caveat is that the mounting instructions are a bit vague.? And B&H's own catalog failed to specify that one must purchase the barndoor frame separately to attach the holder to the Pro-Light. Rated 5 out of 5 by Kappy from Dichroic filter did the trick I'm in the field with my lighting kit a lot. Since I use daylight lighting most of the time, it became tedious to have to clip color gels onto the Prolight for every shoot. While the filters aren't cheap, once they're clipped on, there is no more set up. If I need 3200k for indoor, the filter swings out of the way. Rated 5 out of 5 by Anonymous from Excellent I use this on my Lowel Omni Light, allowing me to use the hot-light in conjunction with my strobes. I use the omni to light backdrops, and Aliens Bees B800 strobes as my key and fill lights. The filter changes the omni to match the color temperature (or visually appears to) of the AB's. Well worth it!